Exercise In A Pill: Are We There Yet? Recent headlines make it seem like we're close to a time when a pill can give you all the benefits of physical training. Does actual science back it up? Here's one researcher's analysis. Meet Ronald Evans, Ph.D., a researcher at the Salk Institute for Biological Studies. Evans is something of a mega-scientist. He has nearly 120,000 citations and a researcher rating (an h-index) of over 160. That number may not mean anything to you, but suffice it to say, Ron Evans is to physiology what Babe Ruth was to baseball—a legend. Evans' research has been very well-funded and published in Hall of Fame worthy peer-review journals, including the Big 3 journals in physiology: Science, Nature, and Cell. Evans also won the Wolfe Prize in Medicine in 2012—which commonly predicts Nobel Prize Winners—and he's one of only about 2,000 researchers worldwide admitted into the National Academy of Sciences. With credentials like this, I can see why a lot of folks think that they've caught a cold when Dr. Evans sneezes. And yet, he's also been behind a couple of studies that have been contentious, to say the least. Not once, but twice, Evans claimed to have found what many in mainstream media have termed "exercise in a pill." Each time, publications large and small ran with the story, as you might expect. And a lot of exercise scientists noticed, but not in a good way. If you're interested, you can go down the rabbit hole of PubMed-indexed protests aimed at Evans' work yourself. So, is the science actually there? Has Dr. Evans indeed discovered two compounds that make all of your time and sacrifice in the gym irrelevant—so that you need only pop a pill and you'll still enjoy all of the physical benefits of exercise? I'll try to present an even, honest perspective on the issue. Let's examine. In 2008, Evans' lab published an article in the journal Cell examining a compound named 5-aminoimidazole-4-carboxamide-1-beta-D-ribofuranoside, commonly called AICAR. Evans' research team reported that four weeks of AICAR injections in adult mice that didn't exercise caused the genes within the rodents' skeletal muscles to modify in a way that resembled what occurs following endurance exercise. Specifically, mice receiving AICAR ran 23 percent longer and covered 44 percent more distance than a similar non-exercise group of mice that were given no AICAR. What's more, four weeks of the drug also amplified genes involved in fat-burning, and in fact, the AICAR-treated mice lost significant body fat and increased their body's uptake and use of oxygen. In short, these are all markers consistent with what you'd expect to see if the mice were to have been allowed to run on an exercise wheel for long durations. In the same 2008 AICAR article, Evan's group reported that a similar compound, the GlaxoSmithKline experimental drug GW1516, enabled exercise-trained rats to run on a treadmill for 60-75 percent longer and farther than the rodents that weren't supplemented. Like AICAR, GW1516 also led to changes of certain genes within skeletal muscle that mimicked what you'd see after exercise training. As expected, the newswires picked up this story and overplayed it like a political scandal. The LA Times, for example, ran with the headline, "'Exercise pill' could take the work out of workout," and even provided a quote from a researcher uninvolved in Evans' work that said, "[With AICAR] you're getting the benefits of exercise without having to do any work." Sounds like every couch potato's dream, right? What didn't make news headlines at the time was that just ingesting GW1516 provided no endurance performance benefit to mice that didn't also exercise, even when the GW1516 drug was consumed for up to five months. So, no, at that time, the science was not there yet. And now, nine years later, Evans' group performed a new study in mice. This time, they tried to explain how GW1516 improves endurance performance without exercising. They couldn't replicate all of their previous findings. For example, GW1516 didn't result in the rodents' muscle fibers converting to a more fit profile, and the rodents' muscles also didn't become denser in the cellular energy and fat-burning epicenter, the mitochondria. However, Evans' group again showed that GW1516 improved running time, which appeared to occur because of a change in fuel utilization not unlike what caffeine is often claimed to provide: sparing glucose, and shifting fuel utilization to burn more fat as energy. Looking just at his research and methods, Evans' studies both offer promising—if not exactly conclusive—findings. Where things get really muddy is when other researchers attempt to replicate the findings. Most prominently, Dr. Frank Booth at the University of Missouri, an exercise physiology icon in his own right, failed to replicate what Evans reported in response to rats receiving AICAR. Specifically, Booth's group observed that five weeks of AICAR injections failed to improve endurance performance in rats and actually decreased certain molecules inside of muscle cells needed for muscle growth. Others have also reported similar and potentially even negative effects on muscle in response to AICAR injections in rats. For example, in a study published in the Journal of Nutrition, injecting rats with 0.001 milligrams of AICAR per kilogram of body weight per day decreased their resting levels of muscle protein synthesis, as well as reducing the muscle protein synthesis response to dietary leucine. It's important to note that there were some differences between these studies, though. For example, Dr. Booth's study used dosing strategies and animals that were quite different than what Evans used in his studies. For starters, Evans injected 500 mg/kg/d of AICAR directly into the tissues involved in digestion and nutrient utilization (what are known as "intraperitoneal injections"), whereas Booth used a dose of only 0.005 mg/kg/d (a 500,000-fold lower dose) that they injected into just below the skin surface (subcutaneous injections). The latter approach assumes the drug will be transported without modification into the bloodstream, whereas the injection used by Evans is a way of trying to bypass the digestive system but to deliver the drug intact to the tissues immediately affected by the compounds the body absorbs from digestion. Secondly, Evans used the male mouse equivalent of a college-aged student or young adult (8-week-old male mice), whereas Booth used middle-aged female rats. Studies have concluded previously that inconsistency in ages among rodents is definitely something that can affect data quality. How any of these differences would carry over to people is conjectural. In other words, confusion still trumps conclusion, for now. Any safe and effective compound that can increase the adherence to healthy living is worth investigating and potentially supporting. However, the hype and raised hopes from the sensationalism of drugs that scientists study in rodents can give people the false sense that a "magic bullet" for healthy living is on the horizon. It's probably not. The reality is this: Many promising "magic bullet" candidates hit a brick wall the second we step outside of a mouse cage. In fact, you can skim the scientific literature for a list of compounds that are effective for treatment of obesity (e.g., leptin), muscle loss (e.g., myostatin inhibitors), or cancer (e.g., TGN1412, IPI-926, MAGE-A3) in rodents, but have proven to be worthless or even harmful when tested in humans. To be fair, however, there are also drugs that are effective in both species for weight loss (e.g., Qnexa, Sibutramine, Orlistat). Additionally, the other studies citing the positive effects of AICAR on obesity, cognition, and immune health, cannot be ignored. [7-9] But again, these studies were all done in rodents. This article isn't a criticism of Dr. Evans. He does good science, and his techniques are state of the art. If I'd discovered what Evans had, then I'd be the first to submit the findings to a juicy scientific journal like Cell or Nature, too. So, no, I don't blame Evans and his lab members for publishing compelling animal data. I only hope to clarify the misrepresentation of that data. That's what exercise does—and that's not even all it does. It also makes you feel better, look better, be able to keep up with your kids, have energy throughout the day, and open yourself up to an immense world of physical possibilities. 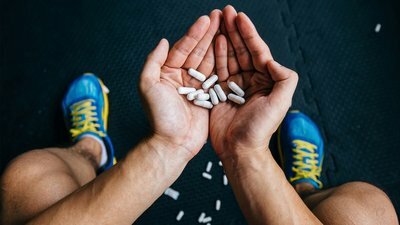 So, has the scientific community found two pills to replace your need to devote time and energy in the gym? Not yet. Until it does—and even after it does—let exercise be thy medicine. Narkar, V. A., Downes, M., Yu, R. T., Embler, E., Wang, Y.-X., Banayo, E., … Evans, R. M. (2008). AMPK and PPARδ agonists are exercise mimetics. Cell, 134(3), 405–415. Fan, W., Waizenegger, W., Lin, C. S., Sorrentino, V., He, M. X., Wall, C. E., ... & Auwerx, J. (2017). PPARδ promotes running endurance by preserving glucose. Cell Metabolism, 25(5), 1186-1193. Toedebusch, R. G., Ruegsegger, G. N., Braselton, J. F., Heese, A. J., Hofheins, J. C., Childs, T. E., ... & Booth, F. W. (2015). AMPK agonist AICAR delays the initial decline in lifetime-apex V̇o2 peak, while voluntary wheel running fails to delay its initial decline in female rats. Physiological Genomics, 48(2), 101-115. Pruznak, A. M., Kazi, A. A., Frost, R. A., Vary, T. C., & Lang, C. H. (2008). Activation of AMP-activated protein kinase by 5-aminoimidazole-4-carboxamide-1-β-D-ribonucleoside prevents leucine-stimulated protein synthesis in rat skeletal muscle. The Journal of Nutrition, 138(10), 1887-1894. Jackson, S. J., Andrews, N., Ball, D., Bellantuono, I., Gray, J., Hachoumi, L., ... & Rice, A. (2017). Does age matter? The impact of rodent age on study outcomes. Laboratory Animals, 51(2), 160-169. Drake, J. C., Alway, S. E., Hollander, J. M., & Williamson, D. L. (2010). AICAR treatment for 14 days normalizes obesity-induced dysregulation of TORC1 signaling and translational capacity in fasted skeletal muscle. American Journal of Physiology-Regulatory, Integrative and Comparative Physiology, 299(6), R1546-R1554. van Praag, H., Fleshner, M., Schwartz, M. W., & Mattson, M. P. (2014). Exercise, energy intake, glucose homeostasis, and the brain. Journal of Neuroscience, 34(46), 15139-15149. Rao, E., Zhang, Y., Li, Q., Hao, J., Egilmez, N. K., Suttles, J., & Li, B. (2016). AMPK-dependent and independent effects of AICAR and compound C on T-cell responses. Oncotarget, 7(23), 33783.